Now you have more ways to maximize your Facebook and Viber app as Globe Telecom brings back the FREE FB services plus FREE Viber! Start your 2015 with good vibes and #ShareYourVibe with #FREEViber and keep posted with the latest happenings on your friends with #FREEFB! Chat and update your status for free with Globe FREE FB and Viber Promo. This will be available to all Globe Postpaid, Prepaid and TM subscribers for 1 month. All you have to do is turn your data connection on to be able for you to use the service. 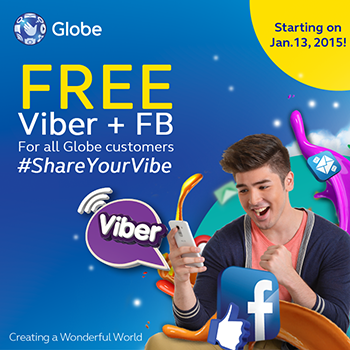 Free Viber + FB will start on January 13, 2015 to February 13, 2015. You have more reason to stay connected with your friends and loved ones with Globe FREE FB and Viber Promo. Get the latest updates on Globe FREE FB and Viber Promo by visiting www.unlipromo.com or you can also check on Globe’s Facebook Page and UnliPromo Facebook page for more promo details and latest updates. we are only receiving free viber notification when we are registered in any TM and Globe promo, but we cannot use it. we cant access.